Something I've seen a lot of people do is to see how fast you can make your character spin in a circle by swirling the control stick. JRPG's are usually great for this because they have no smooth animation on character so they do just spin with one foot out. But the Jak games, Rachet and Clank, even up to Uncharted and Assassins Creed I've seen it happen. Assassin's Creed even had "walking the dinosaur" which exploits the running skid ( http://www.youtube.com/watch?v=e4OjDcDlzAw ). I think that this whole phenomena comes from levels of boredom and how it leads to playing around with things. Take a Bethesda game for example. If you're playing and you get a little bored, you start thinking "hey, I wonder if I can spec as a one class but using the weapons from another class". Get more bored and maybe you'll think "hey, I wonder if I can swap the contents of all the chests in two people's houses." But then if you get really bored you get ideas like "Hey, I wonder if I wonder how much stuff I can shove into this mailbox. Oh now the game slows down whenever I'm in the town that mailbox is in." What leads to this? I'm not sure. But I imagine it's something about how engaging higher level game systems (or even narratives) are, and if those start to fail (or even just lull (like waiting for a wand to fall)) then a player will start exploring lower level mechanics and systems. Sometimes that works, sometimes it doesn't. I know that if I start spinning my character rather then moving to the next objective, it's a good sign I'll be moving onto a new game soon. Glad you guys liked the post and it gave you an idea for a talking point! HECK YES! 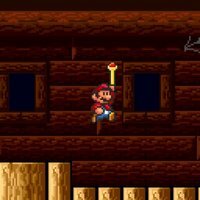 As soon as you mentioned SMB3 on the podcast, I thought: "Jump up to grab the wand".. Had to stop making breakfast to come post this. We talked about this on the VeteranGamers recently, but I don't remember which episode.. My habit is, in Fallout 3 and FNV, to arrange picturesque tableaus while saving. Agreed on the whole "idle hands" theory. When people start to get bored, they find things to keep them entertained. Thanks for the link to your discussion; I'll check it out. Thanks also fro introducing me to a hilarious YouTube sub-genre of Dinosaur walking videos. Thank you for giving us the inspiration! Keep up the great work! Weird how such little things are such huge shared experiences! I wouldn't call it "bored" by the way. I think "restless" fit a bit better for most castes. I think it's a way to deal with sudden variations on how much input the game requires. The important thing about catching the wand is that it happens just after a possibly hectic boss fight. You are full of adrenaline. But then the game goes from action to full stop and there is nothing for you to do anymore. Of course you will search for anything to keep going. Your entire body is primed for reflexes. It's not like you would try to catch the wand during the boss fight. StarCraft players actually do this on purpose. It's called APM spamming. At the beginning of each game, there is not too much to yet. So a 200 Actions Per Minute pro is seriously underwhelmed. This can lead to them getting "lazy" and being not up to speed once the action heats up. So many players force themselves to pointlessly select units in rapid succession to warm up and make their body maintain a high rate of interaction. So I thought I would share that I too, like Jorge, am a big fan of the slow pan. In fact, I was rocking the slow pan in dramatic fashion as I climbed the 7,000 steps to the monastery near the top of "The Throat of the World" in Skyrim when a snow leopard leaped upon my companion and killed her before I could react. Sorry: our spam filter nabbed your comment for some reason! Totally agreed on the term "restless!" It's precisely why I engage in any of the weird little boundary-tests I concoct. Also: high-level Starcraft players are fascinating/terrifying. I love that story! Emergent gameplay: exposing the hubris of all would-be video game directors. It reminds me of the many surprise cougar attacks I experienced while playing Red Dead Redemption. One minute, I'm gazing off into the beautiful Western expanse, the next minute I'm being eaten.